Wait until you hear this! I have reached new heights of fame! Just thinking about everything on my to-do list today is making me feel a little peaked. I think it’s time for Something Chocolate! 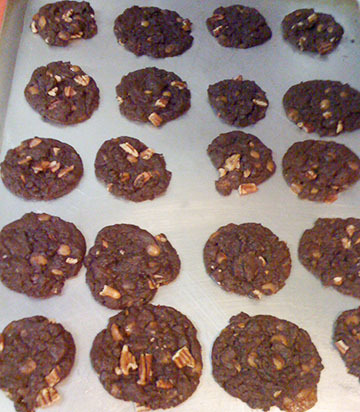 May I offer you some chocolate turtle cookies? And shall we have a look at our pitch? Today’s pitch comes to us from Katie. Katie writes picture books and MG novels, is a puppeteer! (how cool is that?! ), and is a stay-at-home mom to her 2 yr. old daughter and 5 yr. old son. She can be found at her Website, or at A Life Spent Reading, the blog she writes with her critique partner. The Pitch: The trip to Grandma’s house takes forever. Time drags on, and there isn’t enough to do, until a seven-year-old boy discovers an amazing sight. Beautiful hot air balloons fill the sky. Suddenly, this trip may not be so boring after all. Please send YOUR pitches for the coming weeks! For rules and where to submit, click on this link Would You Read It or on the Would You Read It tab in the bar above. There are openings in January, so you have time to polish 🙂 for a chance for it to be read by editor Erin Molta! Katie is looking forward to your thoughts on her pitch! And I am looking forward to checking at least a few things off my to-do list! Oh Susanna – What About Copyright Infringement? Thanks for the comments, Theresa! There is definitely more excitement in the story itself than in the pitch. Something to work on! So glad you enjoyed the cookies, Delores 🙂 Thanks for your comment for Katie! I'm with you, Susanna, regarding work. I've been swamped this week with writing assignments. But there's a light at the end of the tunnel! Katie, a hot air balloon book sounds marvelous. In Iowa, where I'm from, they had a hot air balloon festival. Beautiful sight! So maybe you could capture the uniqueness and brightness and wow factor more in your pitch. I'd be glad to have some writing assignments 🙂 That's terrific, Tina! Good luck getting to the end of the tunnel! And thanks for your comments for Katie! Thanks for the chocolate, Susanna…and especially for starting this blog and following through and thinking of PPBF, Would You Read It Wednesday, Oh Susanna, Short and Sweets, writing contests…yes, you are amazing!!! I read your guest post/interview on Beth's blog…awesome! Katie…great story idea. 🙂 I would definitely pick up the book…and I agree with Carrie, Joanna and the others who gave excellent suggestions on tightening up the pitch and adding some excitement. You're welcome, Vivian, there is always plenty of chocolate around here 🙂 And thank YOU for all your lovely, kind words – they mean so much to me! Thanks also for your comments for Katie! Thanks for the comments, Vivian! This is an intriguing pitch. I can just hear a child saying the trip is taking FOREVER. I have a couple of thoughts that might add to it, first, why don't you use your character's name instead of a description of him, so we can connect with the character? Also, I would avoid words like “beautiful” and “amazing.” They don't tell us much about what's going on. Do the balloons remind him of something? Why is it such an amazing sight? Good luck, and I hope this helps! Thanks so much for your thoughts for Katie, Kirsten! Very helpful! The hot air balloons are intriguing. I'm wondering if the pitch can hint at how the book illustration would work – it could be problematic if the whole book is in the car. But maybe he's passing cows and trucks and the illustrations are more about the view from the windows?